FIRE STATION NO. 1, 10351 96 ST. 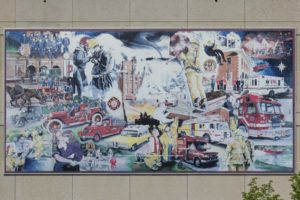 This mural celebrating 100 years of Edmonton’s Emergency Response Department portrays the dramatic challenges faced by the Edmonton Fire Department: the Duncan Block fire that destroyed a Whyte Avenue sweet shop, pancake house, and pet store (#20); a downtown nightclub fire that killed two firefighters (#24); the $2 million devastation of the Northern Hardware Building, the city’s most costly fire at the time (#29); and the 1987 tornado (#30).